We're back in the deep freeze so back to warm trousers and layers again. 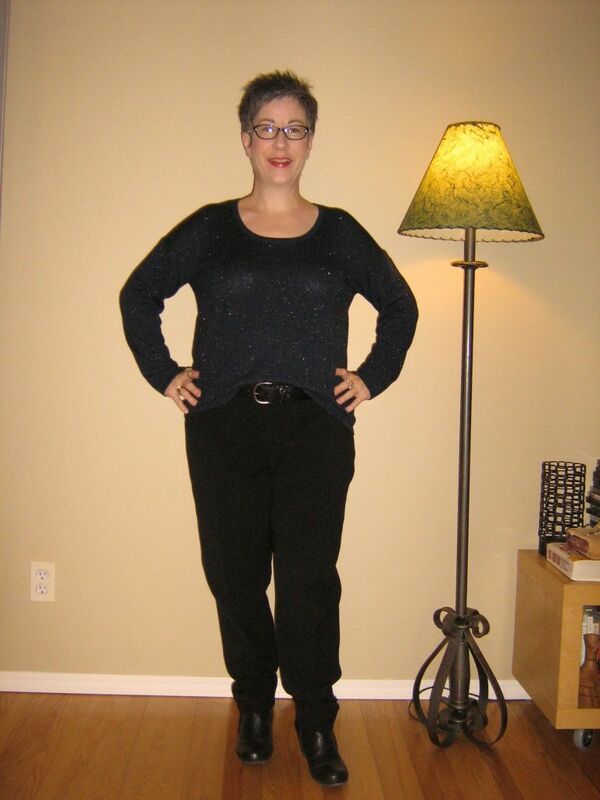 I started with my black slouchy trousers and paired them with my asymmetrical ruched tank. 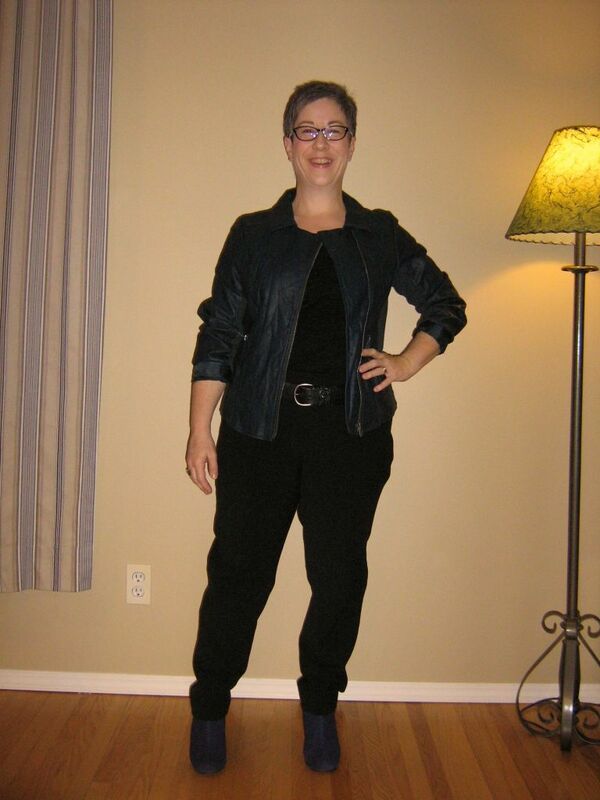 On top of that I added my dark blue pleather moto style jacket. For footwear, I popped on my cobalt suede booties again. My yellow-cobalt clutch seemed like the perfect handbag with this outfit. Although rather dark and moody, my happiness scale is very high in this outfit. An outfit doesn't get much simpler than this - trousers, sweater, booties. That's it. 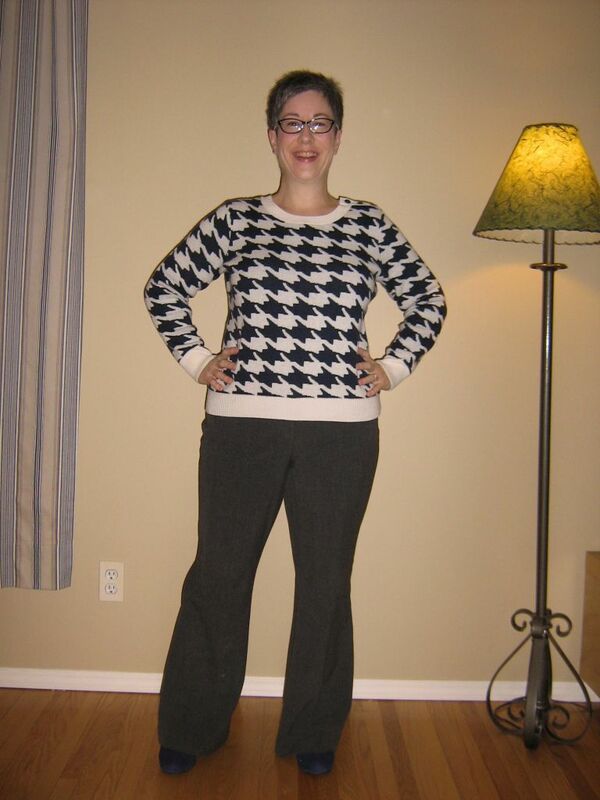 I started with my Gap ivory & navy houndstooth sweater (soooooo soft and cozy 'cause we're back in the deep freeze) and paired it with my grey & navy Glen plaid wide legged trousers. For footwear, I popped on my blue suede booties and my handbag is my red quilted one. A couple pieces, nothing fancy and yet I feel really good in this outfit. What do you think? Simple in a good way or boring? As always, all comments/suggestions welcome. 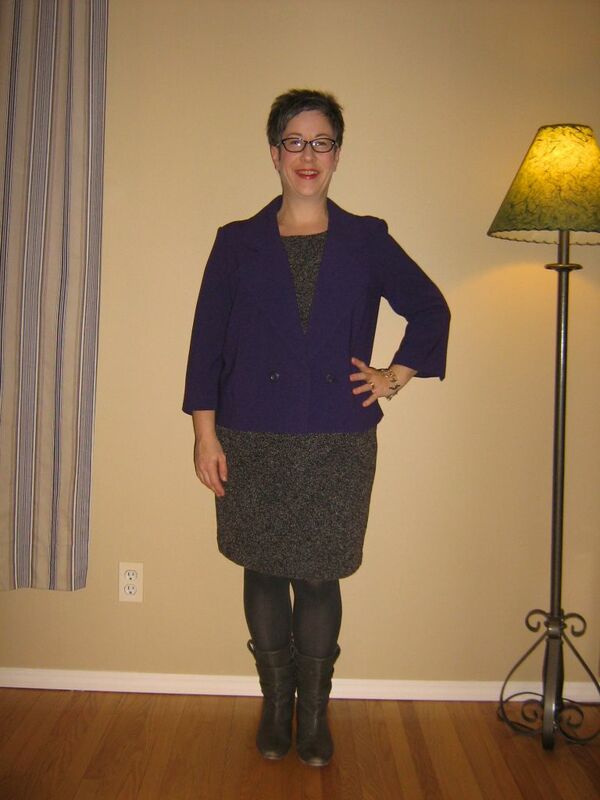 Continuing my need to dress "strong" this week, I started today's outfit with my leather blazer. I've paired it with my black/cream/purple/red abstract pattern midi pencil skirt and a dark purple tank. I've popped on a wide black belt to not only accentuate my waist but the skirt is actually getting a little big and turns around if I don't "anchor" the waist. For footwear, I've got on my Clarks pumps - for a 3 inch heel, these are incredibly comfortable. My handbag is my black/cream leather satchel and jewelry is my silver Haida wedding band. What do you think? Does this work? As always, all comments/suggestions welcome. Ugggg....Monday morning...I'm covering for a lady this week that's on vacation and her boss is a BEAR to work for, so I decided I need to dress STRONG this week. Today's offering started with my black BR sheath dress. I've topped it with a graphic black/white striped knit blazer. 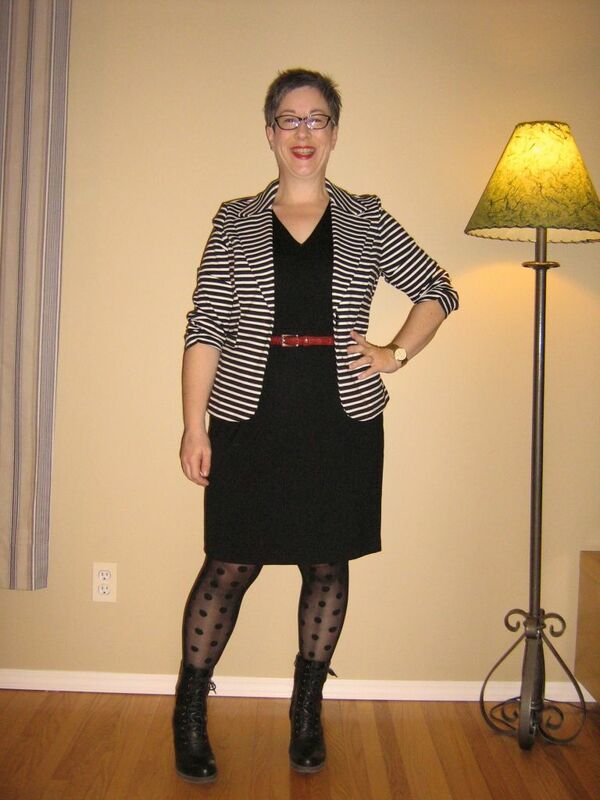 I then added a touch of dark red at the waist with a belt, polka dot tights for pattern mixing and my Doc Marcie boots 'cause they make me feel fierce. My handbag is my vintage Cartier as it pulls out the dark red of the belt. Gold wedding ring and watch and a swipe of dark red lipstick and away I go. What do you think? Good outfit to start off a tough week? As always, all comments/suggestions welcome. Heading out to my hairstylist to get a trim - it's a little warmer today (whoo hoo!) so didn't have to bundle up quite as much as I have over the last two weeks. 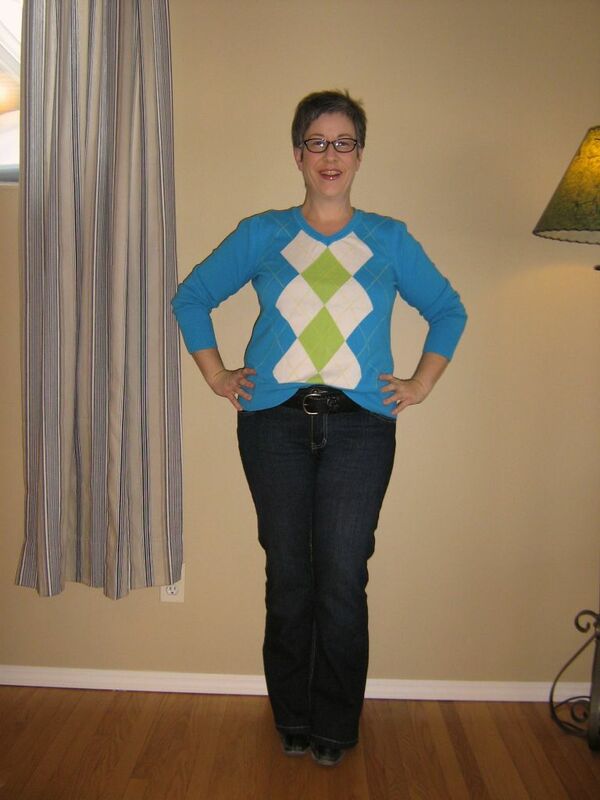 I popped on my Suko bootcut jeans and a bright blue/white/citron argyle sweater. On top of that when I head out the door, I've got on my citron puffer and white scarf. Hope you like one of my rare weekend outfits and that you're all having a fab day! Soooooo glad it's Friday - and it's another cold one! But it looks like we're going to get a reprieve from the bitterly cold temperatures starting tomorrow. Thank goodness! Have I mentioned I love these jeans??? 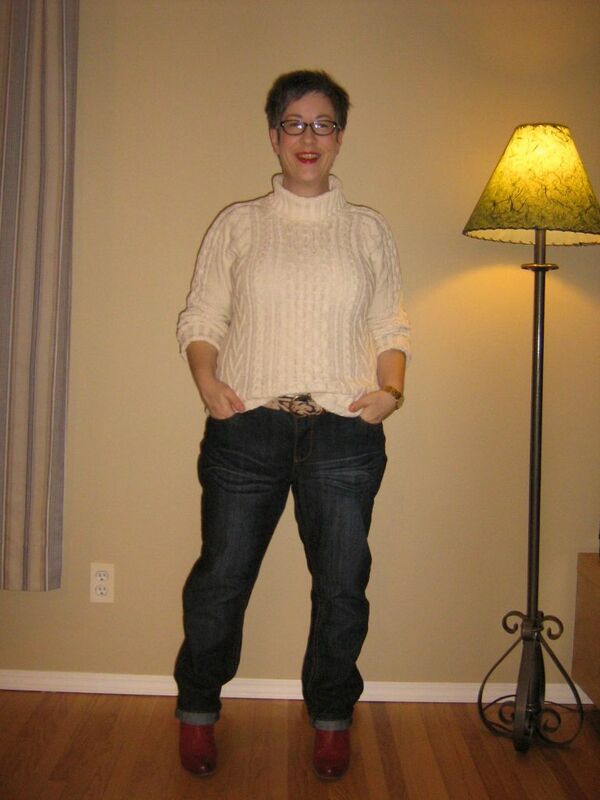 I've paired my skinny slouchies (the one size up pair) with my cream coloured chunky knit sweater. I've added my snakeskin belt for a bit of pattern and semi tucked to show it off a bit. For footwear I'm wearing my red SE booties and decided for a bit more colour and pattern, added my red and animal print clutch. Jewelry is my gold wedding ring and gold oversized watch. Happiness factor for this outfit? Off the charts! Over to you...what do you think? Does it all work? BTW,, I really should have these jeans hemmed up a bit as they are about an inch too long but I kind of like the bit of cuff. Am I crazy? I'm discovering that I would rather wear a repeat outfit in its entirety that I enjoy wearing, instead of re-mixing for the sake of re-mixing and coming up with something "meh". 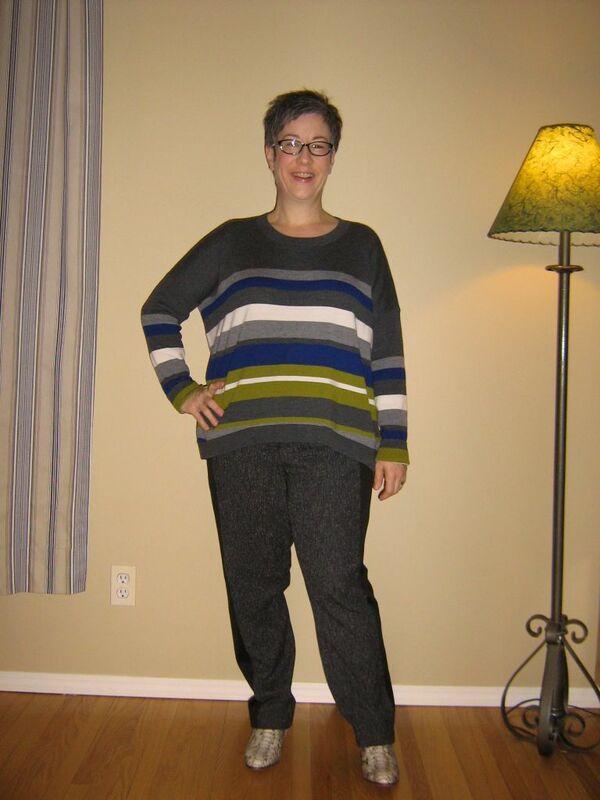 So today I've paired my tweed front slouchy trousers with my L&T voluminous striped sweater and my python booties. I've worn this combination before so look away if it bores you! Last time I carried by black/white handbag with this combination, but today I've decided to up the snakeskin ante and have added my Elliot Lucca handbag. I like how the handbag pulls out the cream and green stripes in the sweater. What do you think? Is it too much snakeskin? As always, all comments/suggestions welcome. The last few days, I've been craving wearing a dress - guess you can't take all the "lady" out of Urban Lady Prince! So despite the continuing cold, I popped on my charcoal boucle knit dress with grey patterned tights. On top of that, I've added my purple Amber Sun jacket. I wish I had also purchased this jacket in the teal colour as I adore the shape and always enjoy wearing it. For footwear, I'm continuing my column of grey colour by wearing my mid-calf grey Frye boots. I am wearing a touch of jewelry in a bracelet my husband gave me several years ago as a gift. I love the uniqueness of it - from a local jeweller. Now rest assured when I head out the door into the -39C, I will have slipped on a pair of thin ski pants over the tights, swapped the Frye's for my Blondo Vergara boots, added a scarf, mitts and my red down LE knee length coat. I'll be snug as a bug in a rug. What do you think? Does this work together? As always, all comments/suggestions welcome. More trousers today thanks to the cold - I popped on my black slouchy trousers to start off the outfit and then added my dark ink blue sparkly top that DS gave me for Christmas. It's a hi-low hem and is the perfect shape and length for a semi tuck. I've added a simple black leather belt with gunmetal buckle and my black wedge booties. For jewelry, just a ring for each hand and my handbag for the day is my yellowy-cobalt snakeskin clutch. I love the simplicity, comfort and cozy factor of this outfit. What do you think? As always, all comments/suggestions welcome. It's hard to be inspired with your outfit when really all you want to do is stay under the covers and keep warm. We have a windchill warning this morning and it is currently -42C with the windchill (the temperature on its own is -30C). And no relief in sight for the next 4-5 days from these frigid temperatures. I hate January in Winnipeg! 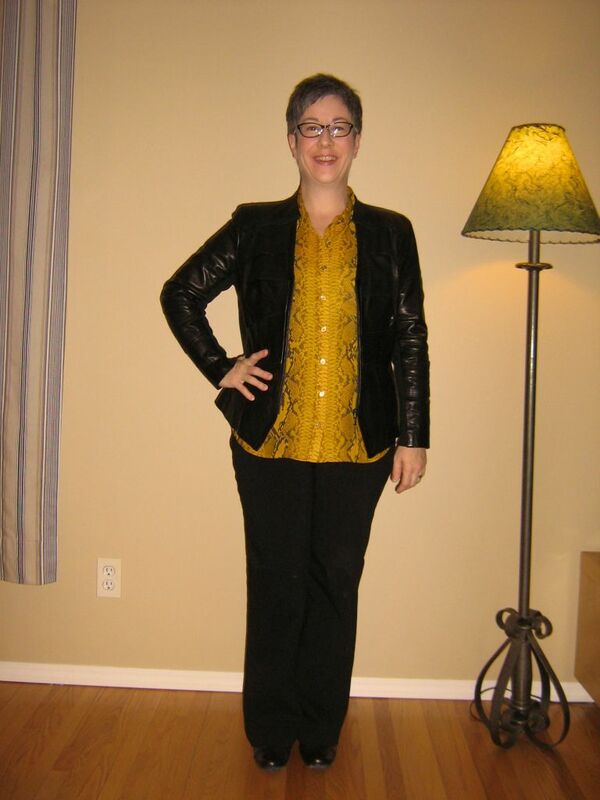 My outfit started with simple black trousers, to which I added my gold & charcoal snakeskin print blouse. On top of that is my black leather blazer and for footwear, my simple Clarks shooties. For a handbag, I chose my Christopher Kon pebbled black leather with gold hardware hobo style bag. This outfit isn't exactly exciting but it's warm and comfortable and today, that's what counted. It's interesting to note that originally I put on my slim Calvin Klein cigarette trousers and then changed into these pants - I really am over skinny trousers. Anyway, what do you think? Proportions ok? Boring or interest? As always, all comments/suggestions welcome.